Hello, poor loyal blog reader who’s been set adrift along the winding paths of the internet with no safe harbour in which to dock your thoughts, fretting over my lack of update last Friday. Not only did I have much more to do than I usually do on any given Friday – father-in-law and a friend from Joburg were staying with us to participate in last weekend’s Argus Cycle Challenge (more on that in the next update) – but I also ran into some space/image storage issues right here on WordPress. So much so that I wondered whether it was even worth continuing with this. But, on reading up on how taking photos helps keep memories alive in later years, I gave myself a little pep talk and plunged in, for the benefit of my future self if nothing else. So, rather than pay to keep adding to the blog you’ve known for four years I chose to go with a whole new blog, which you’re now feasting your eyes on. I know, I know, it actually looks very similar to the old blog, but I’ll slowly be easing in some changes to the format so it’s not too much of a shock to the system. I had my default toasted cheese, drenched the chips in sauce and washed it all down with a Wimpy coffee. The doggies tested their ‘cat skills’ by perching on the back rest of the couch. They’re very good at it. The doggies prompty stopped the cat act when the vaccuum cleaner came out to ensure all was a-sparkle for Grampa’s visit. Both look very much like dogs here. With Easter just around the corner, I couldn’t resist these chocolate-topped and filled hot cross buns. With coffee, of course. Later that afternoon we lunched at Jerry’s Burger Bar on Kloof Street with mum and dad. I went for the pulled pork burger with a slice of cooked apple, washed down with a gingerbread milkshake – just as good as the version in Blouberg. T’was, as Roald Dahl would say, ‘scrumdiddlyumptious’. But Husband’s Philly Cheese Steak burger was even better, remind me to have that next time! Husband had the full salmon eggs benedict, I went for the half-size option with bacon. Very tasty indeed. When we got to Mum’s for lupper, she whipped up a batch of fresh scones with jam and cream. Lovely afternoon tea. Can’t believe our furry little boy dog is already six. Click here if you’ve forgotten what I wrote about him on his fourth birthday. Doesn’t he look smug! 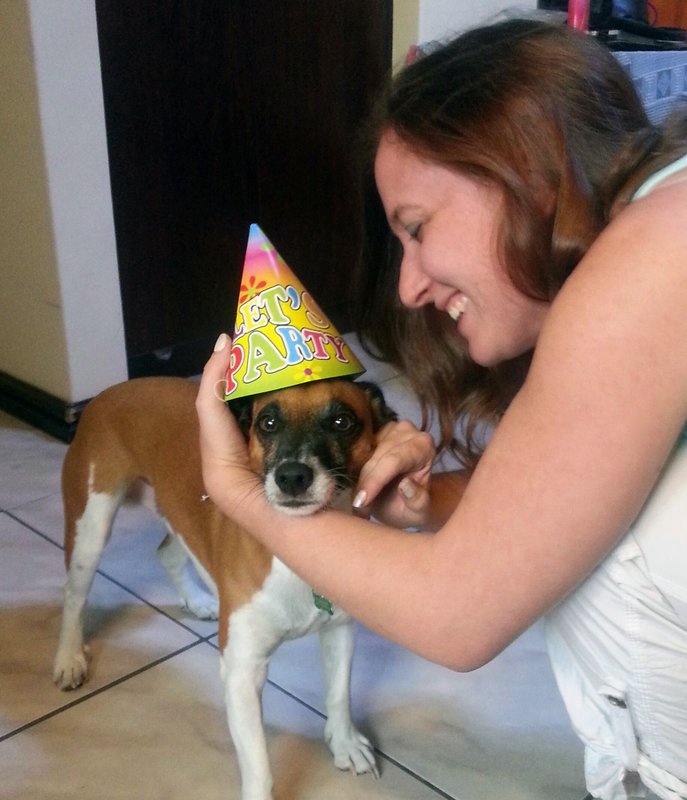 Over the years he’s learned to tolerate wearing the birthday hat. Click here for a reminder of last year’s birthday hat photo. The second he unwrapped his squeaky piggy birthday toy Bertie ran off to unstuff and desqueak him. He happily pulled out bits of piggy innard for hours on end. While Bassie doesn’t like squeaky toys, she’s a real jealousy custard, so her grandparents got her a chewy rawhide toy. This was her guilty face when I caught her eating it on the bed. Soon he was a happy, tired boy, happy to snuggle on the couch. Happy birthday, Bertie Andrews! such lovely children, all 4 of you.